See the what Rancho del Cielo is about and it’s significance. The legacy of the presidential retreat and why it served as the Western White House during Reagans Presidency. Watch the changes fly by and see how the Ranch played a part in history for Reagan and his family. Take a trip around the Reagan Ranch with a tour of the points of interest. The Center showcases the story of the Ranch and its place in history with Reagan and the public. We inspire the next generation of leaders through hosting, tours, and other events. Ronald Reagan had a very special bond with Young America’s Foundation students. View the beautifully preserved 688-acre ranch and Western White House. See the legacy that Ronald Reagan left behind with the Reagan Ranch Center and its exhibits. We hold conferences for our clubs and members all year long. View what conferences you can be a part of. Take a look at our calendar to see where our upcoming events are going to be and how you can attend. Ronald Reagan’s love for the ranching life preceded Rancho del Cielo. He had owned ranches elsewhere in California—in Northridge, Riverside, and Malibu. As his second term as governor of California drew to a close, he began looking for something much more secluded. He found it when friend Bill Wilson pointed him toward the Santa Ynez Mountains in Santa Barbara County—about a 45-minute drive from the city of Santa Barbara—where he came upon a 688-acre spot with a tiny circa-1872 adobe house. He immediately fell in love with the place. “From the first day we saw it, Rancho del Cielo cast a spell over us. No place before or since has ever given Nancy and me the joy and serenity it does,” he stated. For Reagan, the Ranch became a second home, not only as a private citizen in the 1970s but also while he was president and in the immediate years thereafter. He often observed that he believed the more he visited the Ranch, the longer he would live. This was Reagan’s Mount Vernon. And more than a vacation home, the Ranch is where Ronald Reagan came to make some of the most important decisions affecting his-and our nation’s-future. One of the more ridiculous caricatures of Ronald Reagan as president was the unfair, inaccurate assertion by critics that he was lazy and too old to be president. Quite the contrary, Ronald Reagan was in superb physical condition—as evident in his longevity of life—and was an extremely hard worker. Nowhere was this more evident than at Rancho del Cielo. The 40th president “relaxed” at the Ranch by working at the Ranch. His unique method of relaxation included cutting wood, clearing brush, and a penchant for chopping up used telephone poles that found new life as a sturdy, winding fence. Reagan’s typical companion on the trail was a chainsaw, which could often be heard buzzing loudly through the canyon. Reagan’s only genuine forms of relaxation—at least by most definitions—were his horseback rides during the day and his reading by the hearth in the evenings. When Reagan was not “recharging his batteries” behind a saw or in the saddle, he was doing so by driving his beloved blue Jeep, a gift from Mrs. Reagan, along the ranch trails. During the 1980s, Rancho del Cielo took a profound turn, transforming from a mere ranch high atop a hill in Santa Barbara County to no less than the West Coast headquarters of the presidency. The Ranch came to be known as the “Western White House,” as President Reagan would spend a full year’s time there during his two terms as the nation’s chief executive. The small ranch home became a remote extension of the Oval Office, equipped with a simple push-button telephone that served as a line of communication between the American president and the outside world—though certainly not the only connection, as the Secret Service set up a fully functional compound beyond the ranch house, which included all of the latest telecommunications technology. Despite his distance from Washington, D.C., the 40th president was fully capable of performing his official duties from the Ranch. Presidential duties at the Ranch were quite varied, ranging from telephone calls to heads of state and Cabinet members to celebrities such as comedian Jerry Lewis and baseball player Willie Stargell. 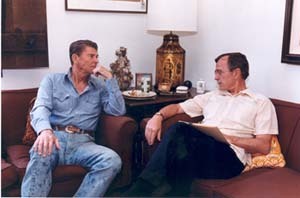 President Reagan also played host and held meetings at the Ranch. He met there with White House staff, his Cabinet, Vice President Bush, and with heads of state including Queen Elizabeth II. There were dozens of significant events that occurred while Reagan was at the Ranch, including several that required immediate presidential action. These include the August 1981 signing ceremony for the Economic Recovery Tax Act and the president’s decision that same month to fire 11,359 striking air-traffic controllers. The latter moment came during Reagan’s road to recovery from the assassination attempt where the Ranch once again worked its therapeutic magic on the man’s body and soul. At the Ranch, the president also grappled with how to react to several national and international tragedies involving the painful loss of American lives, from the April 18, 1983, bombing of the U.S. embassy in Beirut, Lebanon—which killed 32—to the calamitous explosion of the U.S. space shuttle, The Challenger, on January 28, 1986. Perhaps the gravest moment the president faced at Rancho del Cielo occurred on September 1, 1983. Early that morning, Reagan received a call from National Security Adviser Bill Clark informing him of preliminary reports that a South Korean airliner, Flight 007, en route from New York City to Seoul, had been shot out of the sky by Soviet fighter planes. “Bill,” Reagan reacted, “let’s pray it’s not true.” It was true. The plane held 269 passengers, including 61 Americans. There were no survivors.